The Muzak Heart & Soul Foundation’s NOISE! music camp for gifted high school students, currently underway in Nashville, gives students a hands-on learning opportunity through a series of field trips and lectures from top music industry professionals. On Thursday July 22, thirty-two NOISE! students from all over the nation recorded an original song co-written with Better Angels Music songwriters Jay Brunswick and Matt Rogers. The song, entitled “Unity,” was recorded at Ocean Way Nashville Recording Studios. Four different NOISE! camp students, Jimmy Gatch, Caitlin McCarty, Mignon Grabois and Logan Gardipee sang verses while Scott Jacobson added his own free style rap. The entire group attending participated in writing the song. This year’s NOISE! sponsors included Muzak LLC, Belmont University, Best Buy Musical Instruments, Taylor Guitars, Loews Vanderbilt Plaza, Matchless Transportation, South Central AV, Dan McGuiness Pub, Blind Pig BBQ Restaurant and Maggiano’s. The Muzak Heart & Soul Foundation was established as a 501(c)3 non-profit public charity organization in 1998 by Muzak LLC. The Foundation’s mission is to support and redefine music education throughout the United States. 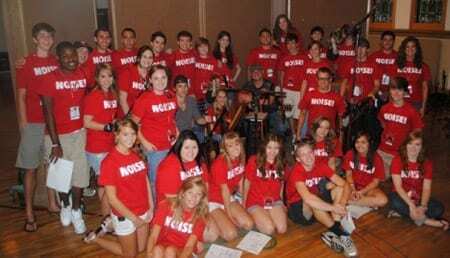 The Muzak Heart & Soul Foundation helps students turn their passion for music into real world opportunities, providing teens with new and exciting programs focused on all aspects of the music business. To learn more, visit www.Heart.Muzak.com or call 800-242-3129.